The shortlist of nominees for Kingston’s Big Read project for next academic year has been announced and will feature the books The Immortal Life of Henrietta Lacks, Little Fires Everywhere, Eleanor Oliphant is Completely Fine, Himself, Home Fire and Tin Man as next year’s choice. The Immortal Life of Henrietta Lacks written by Rebecca Skloot is the hidden story about a poor tobacco farmer whose cancer cells went on to change the medical world forever. Little Fires Everywhere by Celeste Ng is about a single mother with a mysterious past who moves into a picture-perfect neighbourhood and struggles to fit in. Eleanor Oliphant is Completely Fine by Gail Honeyman is about a woman whose carefully planned everyday routine is interrupted by an unexpected event which forces her to familiarise herself with a world she previously tried to shut out. Himself by Jess Kidd is about a man returning to the town where he was born to uncover the story of his mother which left him at an orphanage when he was an infant but uncovers the towns dark past and misdeeds. Home Fire by Kamila Shamsie is a compelling family drama which sees the fate of two very different families intertwine in a collision of love and politics. Tin Man by Sarah Winman is about two inseparable boys growing up together when a girl becomes a part of their lives and changes everything. 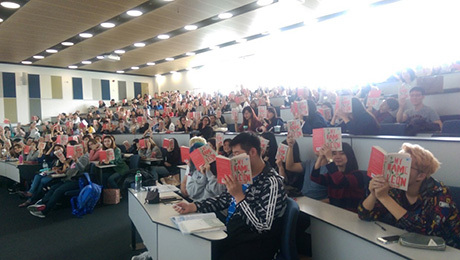 The KU Big Read project, which won a national prize last year, sends a free book to each new first-year student, both from the UK and abroad, before the start of each year as a welcome present to arriving students as well as being available to all student and staff. The initiative started as a part of the university’s SADRAS scheme which is about staff and students collaborating towards getting funding for their projects and was first put in place in 2015 with the book, About a Boy by Nick Hornby. The nominees are chosen based on several factors including the length of the book, whether it will appeal to both men and women, availability for the author to come to Kingston for a talk as well making sure it is a relatively new release so that it might be something the students have not read yet. Bearing in mind these factors, both students and staff cooperate in picking out the nominated titles. The winner and final pick for next year’s book out of the total six shortlisted titles will be announced at the end of April.